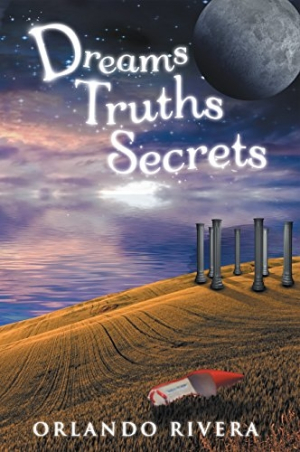 Dreams Truth Secrets is a philosophical novel that bets on big ideas about money, power, and what matters in life. Orlando Rivera’s introspective novel Dreams Truth Secrets uses fables to trace a path from devastation to inspiration. Jack Kingsley had it all: a doting wife, a job he loved, fabulous wealth, and children he adored. Then, he lost it all. The story begins just after Jack’s wife Ellen tells him she didn’t marry him to struggle after he loses their wealth and privilege through a series of bad choices. Jack doesn’t know what to do, so he returns to a bench overlooking a beautiful ocean view which he enjoyed in his youth and considers his fate. Enter Barbara Bailey, a woman who knows about struggle and the power of finding your passion. Barbara’s brief appearance sets Jack’s mind reeling and he discovers Fifty, a fifty-dollar bill that is the personified spirit of wealth in the universe. Fifty tells stories, and Jack learns some of its secrets, including about wealth, fortune, and the value of relationships. The book focuses on the two main characters of Fifty and Jack. Fifty’s character is an unflappable and unchanging God-like figure who dispenses wisdom, while Jack grows from a man who felt there were no friends in business, only enemies, to someone who ends up returning to his family. The lessons he learns are never tested in the real world, though, and it’s hard to gauge how much real change has occurred for him. When the book ends with Jack waking from a dream and not knowing what to believe, it becomes too clichéd. The fables shared with Jack include traditional fairy-tale elements. Their descriptions are clear, as are their settings, and they reflect a range of Eastern and Western styles. They exemplify the book’s main ideas about what to value in life and the importance of making good choices. Their princes, mysterious old women, far off kingdoms, and magic are interesting, if they do not carry enough emotional weight to support the novel’s central characters. Nearly all chapters begin with one such vignette and end with suggestions for the next lesson, and Jack gets lost beyond them. The book mostly advances via dialogue between Jack and Fifty, all occurring at the same place, and interest stagnates as a result. Their language is stilted, especially in comparison to the stories. Most action in Jack’s life is confined to his mind, and while his ideas are heady, they don’t carry the story forward meaningfully.